Recently, a number of things have come together, and I feel myself undergoing a developmental leap in my practice and professional identity. I am manifesting that change through two decisions: leasing my own therapy room, and rebranding my practice. It is unlikely to be a coincidence that Generation Rent is a political topic of the day. The transience and rootlessness of renting therapy rooms by the hour is something I have begun to find unbearable. The experience is interesting. Renting a space means more than just renting a space that belongs to someone else. After all, I haven’t bought my own building; my new therapy room is still on a lease. But there is a substantial difference between hiring a space, and a hire-space. My new room is in The Ethical Property Company‘s centre on Colston Street. It is “my” space in so much that I contract with Ethical Property for use of that space to be exclusively mine for the period of the lease. Importantly, this means that the shaping of that space is down to me. I am free to create, not simply a therapy space, but my therapy space. Every decision about shaping this therapy space becomes a consideration of how this space can express the possibilities of my practice. Contrast that with the nature of a hire-space, a room whose function is to be hired. The decoration may range from magnolia boxes, to beautifully themed rooms. But the spirit of the room, its very structure, is one of transience. The room is hired by many therapists, but belongs to none. It is no one’s “home room”. I tend to feel this as a sense of emptiness in the room; it is missing the many, tiny, background cues that suggest there is one specific person using this space on a regular basis. In terms of figure/ground formation, the ground doesn’t support the figure of a tangible therapist. On the one hand, this means that it supports a kind of everytherapist, which certainly maximises the utility of the room as a hire-space. But this invites the therapist using the room into an everytherapist role. Just as any therapist could be using that room, so too could the clients who come to the room be seeing any therapist. The effect for me now is similar to every town having an identical high street; the unique element of soul that arises from place goes missing. This has been ok so far. Gestalt therapy can be practised anywhere, with the only requirement being that the environment in which the therapy is situated be explicitly included in the therapy. There isn’t a correct set-up for the therapy, there is only the co-created experience of the therapy session, in awareness. If the therapy takes place in a soul-less box, then the experience of being in a soul-less box can be invited into the foreground for exploration. It is simply that my needs have changed, and now I feel constrained by hire-space in a way that I haven’t before. Consequently, I am in the process of setting up my new room, and will practice from there as of the beginning of September. A second need that arose as I made the decision to lease a room, was the need to attend to my professional identity. I feel like I have outgrown Silver Cat Psychotherapy, that this particular image no longer represents my practice. So, over the next few weeks, I will be transforming into the bristol therapist, a practice name that is more rooted in place, and reflects my sense of gestalt therapy as a particularly Bristol-ish approach. If psychotherapy was the UK, gestalt would definitely be Bristol! And just to make that transformation process suitably challenging, I’ll be moving this blog to a new website, the very definition of growing pains! I feel a mixture of excitement and trepidation. I wonder if my room will fulfil my expectations, or if I’ll discover that it’s no different to hire-space when it comes right down to it. I notice how applicable the cycle of gestalt formation and destruction is to specific projects like setting up a new therapy room and rebranding a practice. As I was reading I was aware of something from my own therapy (and more specifically, the room) that I wanted to share with you. When I started therapy there was a little hanging plant in the corner. As I skilfully avoided, squirmed and wriggled my way through the first years of therapy, this plant became a resting place for my eyes- and each week I would check in with it, watching it grow as a physical representation of the growth I was experiencing too. At the end of therapy my therapist left the room, and she gave the plant (which by now was a jungle of greenery) to me. It’s still in my hallway, growing away happily. 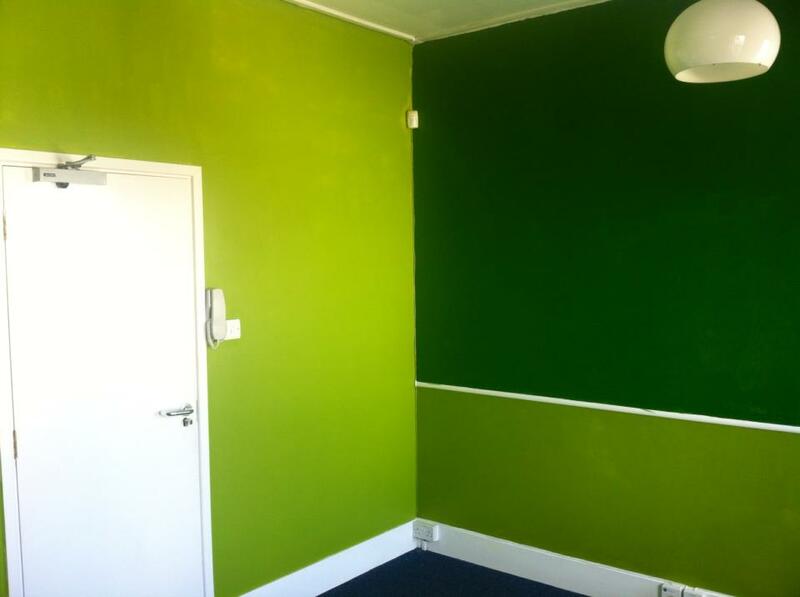 The greenness of your room reminded me of growth and that plant, I hope you and your clients are truly nourished by it. That’s a lovely memory, thanks for sharing! I like the idea of a plant that will grow and bush out over time. I will acquire one. Hi Simon I enjoyed reading your views on therapy rooms. I rent on an hourly basis at the Practice Rooms in Bristol and possibly Bath if ever required. I also have a room where I live not in my house but to the side. I am thinking of just working there for my private practice and EAP work. I do feel safer and more at home there to work plus it is a large room so more dynamic work is possible also no worries about clients making noise if necessary. So I may consolidate. All the best as The Bristol Therapist I will look out for you. Ps one day I will get my website up together like yours.